Randi – you’re doing a beautiful job on this. Love the flowers and feathers. 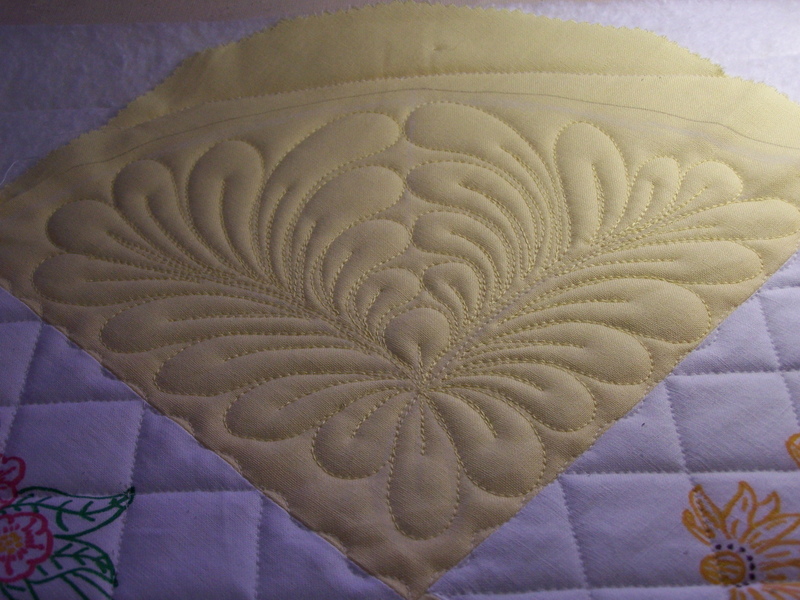 I do see the problem, but do you think when it is off the quilt, it will relax enough not to show too much? I sure hope so, but I have a bad feeling…it looked fine one block at a time, and from the vantage point of my stitching. It was when I walked to the end and looked down it, and I suppose it will be the same way across, too. I’m praying for a quilting miracle. I think that once it’s off it should relax and be fine…at least I hope so. I think the quilt is looking great so far…good job! Beautiful, Randi!!! I’m on the “I think it will relax once it’s off the machine” group too! And let it relax before you make any movement towards it with the seam ripper! Randi, It is really pretty. I am voting for not frogging, at least until the whole lot is done. Look at it front on when the whole quilt is finished and then, and only then, frog the lines that need it. I think it will be fine. Really. 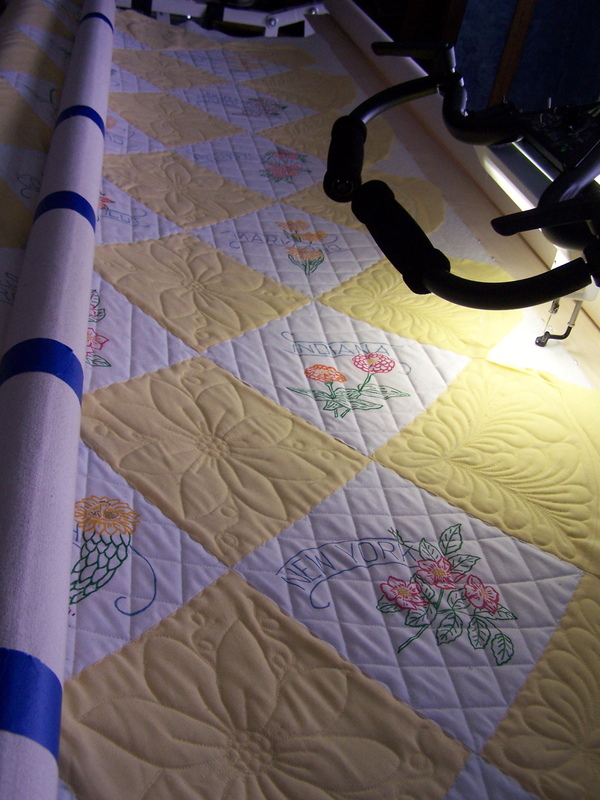 You are looking at this with the perfectly parallel bars for comparison, but it will look different when you view the quilt as a whole. Listen to 2L, she has some good points there too. You have done a beautiful job on this quilt – leave it alone! It looks wonderful. Do not frog! Take it off and walk away. You probably won’t even notice the “problem” (which I don’t even see!) It is beautiful!! Step away from the seam ripper Randi! Michelle, gave you some exellent advise. No one but you will ever know that your lines aren’t perfect but neither is the quilt top and your quilting is beautiful. I love the motifs you are doing, they are wonderful. Your customer will be thrilled at how it looks. 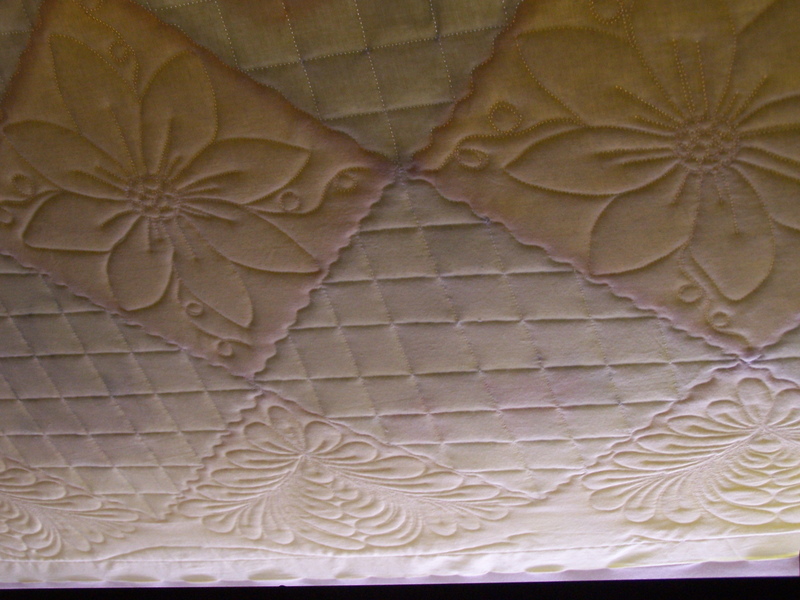 I think the quilting is lovely and am eager to hear how you find the stitching once you remove the quilt from the machine. I enjoyed seeing the photos! Oh I think it is lovely. From a long-arm wannabe, I’m totally enthralled. Question for you…….. when you do the cross-hatching do you have to stop and start at the ends of each line? Can’t imagine having to snip all of those threads. Nancy, you “bounce” from one point to another, going in the ditch between points if you hit a spot where you can’t “bounce”. Clear as mud? Thank you all for the encouragement…I’m feeling much more positive this morning…I think it will be ok.
You are doing a beautiful job. I wish you could do one of mine! Randi, your work continues to amaze me. Listen to the others…..there is no need for frogging. Definitely you should frog, Randi… I agree with you 125% ! Sorry, I couldn’t resist. Silly girl ~ the quilt looks beautiful. The top has a very ‘vintage’ look to it. You’ve done a wonderful job on this old top. I know the owner will be delighted when she sees it completed. Is she putting a label on the back? 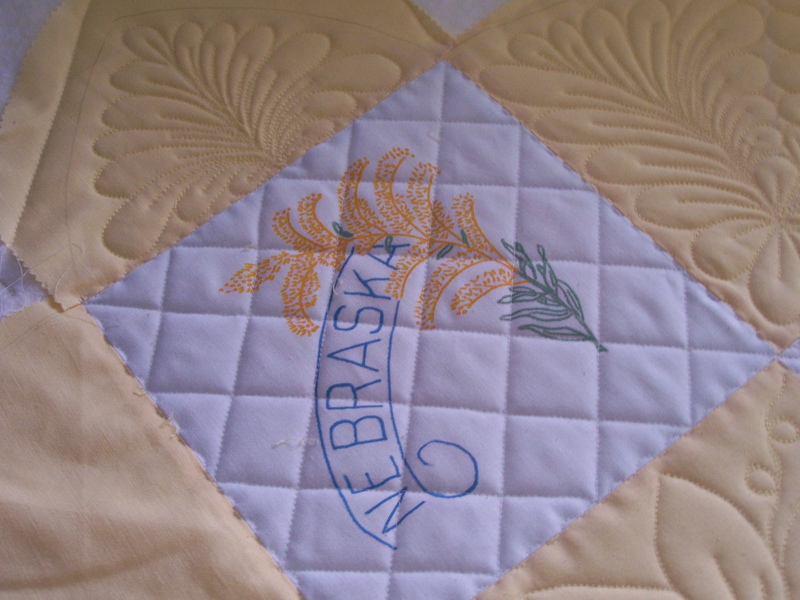 The quilt really is an heirloom now, isn’t it? Very, very nice, Randi. Congratulations. Wow, Randi! It is really beautiful and I agree with the others – when it is off the frame and relaxed and you don’t have the bars to compare your lines with it should look just wonderful. NO FROGGING!!! 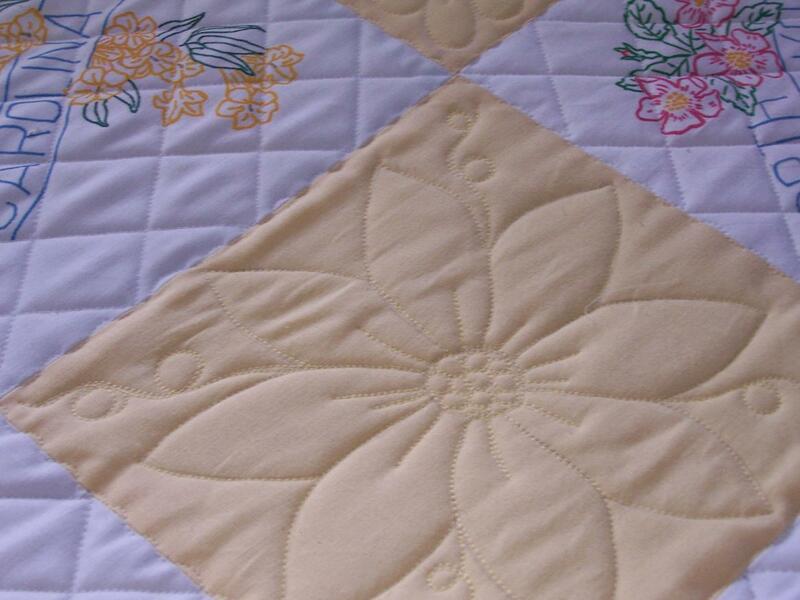 Your design choices and your beautiful stitching really make this quilt a winner! I think if you frog ANY of this, we will ALL arrive at your house to remove the seam ripper PERMANENTLY! It is gorgeous! Repeat after me: Creativity is NOT perfectly symmetrical or even…it is CREATIVE! I love seeing your work. 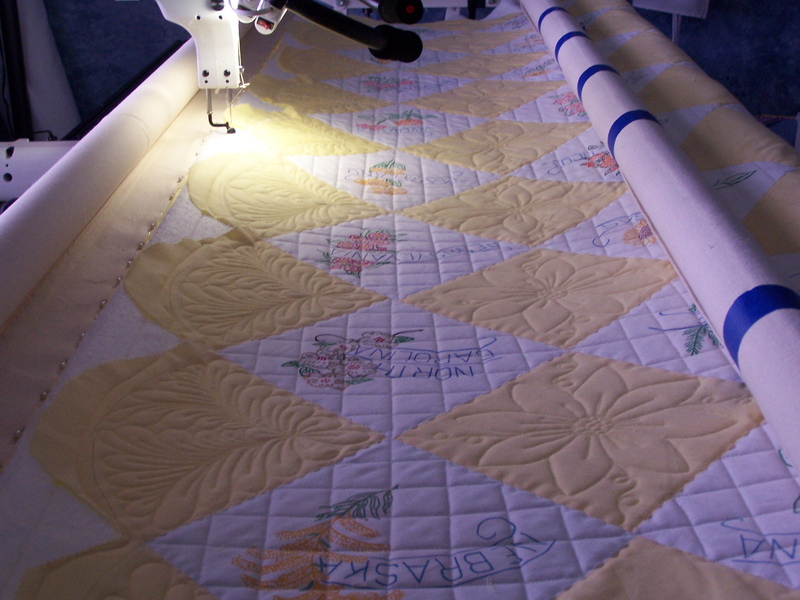 I’m anxious to get my HQ16 up and running and try a bit of machine quilting of my own.